Gray water is water that’s not clean enough for drinking, but is fine for using in vegetable and flower gardens. It can include gently used water from showers, baths, dishwashing and laundry. You can build a gray water system that collects water from sink or tub drains, then pipes it outdoors. Instructions on building a gray water system are at the website of California’s Greywater Action. The systems can be as simple or complex as you want them to be. 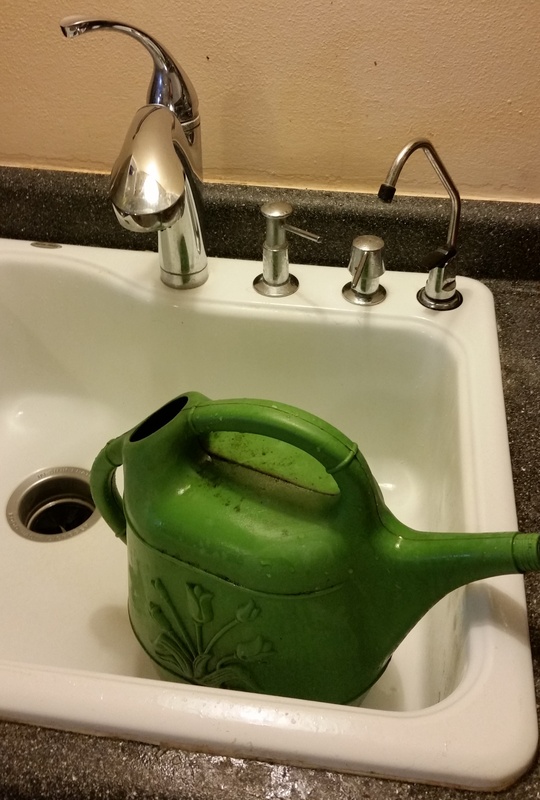 I go for the very simplest approach myself: keeping a bucket or watering can under the kitchen faucet to catch water when I’m washing my hands. In the garden, I also empty out any water I use to clean the blender or various pots and pans. The little bit of soap or biodegradable detergent that ends up in the water does not harm plants. Cooled down cooking water also makes great gray water, although I err on the side of caution and don’t use salted pasta water on my plants, since salt is bad for most garden plants. You can find more information about what can go into gray water and what shouldn’t here.